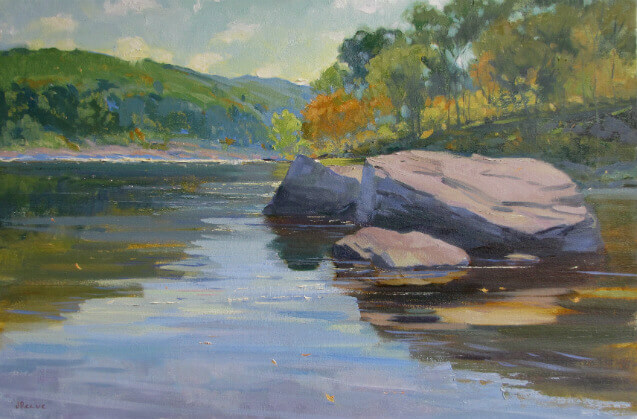 Over the month of September and October, I have been working on a series of landscape oils along the Delaware River at a place called Skinner’s Falls. There are many areas on the river where the water dramatically slopes in a shelf like fashion. Not a clear “falls”, but a sudden drop in elevation. Many of these areas like Cook’s Falls and Skinner’s Falls would better be described as a series of rapids over an under-lying bed of shifting rock. Skinner’s is the largest of such places. It also has a large area of exposed rocks that travel along the bank and move outward toward the center of the river. These rocks are quite scarred with almost lava like shapes. They are also very large. 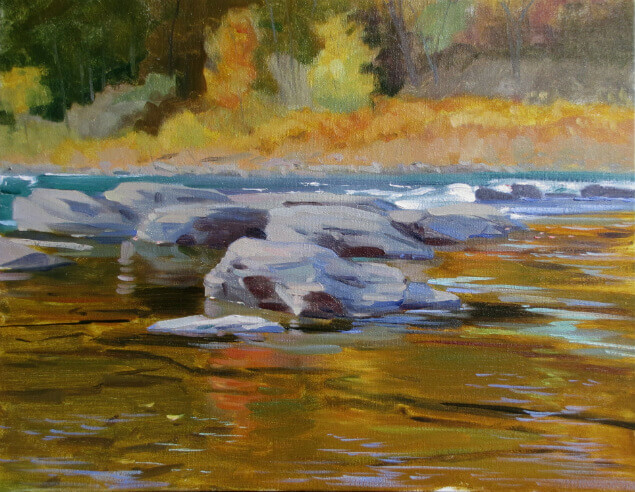 As an artist, such rocks allow for one to set up on them and project one out into the river. Hence, there are many vantage points on which to capture the essence of the scene. I prefer to work in a “series” where I paint multiple images of the same scene. This really allows me to analyze my subject and find, not just the grande view, but more subtle and, at times, a more sublime vision of it. 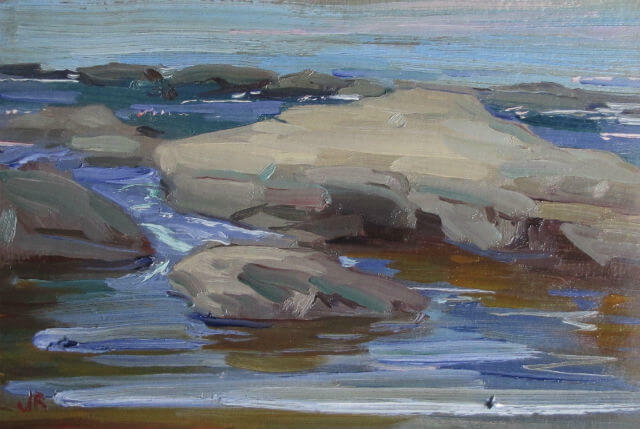 Most often, the initial view that takes in the whole scene, does not present in a clear way the character of the place. 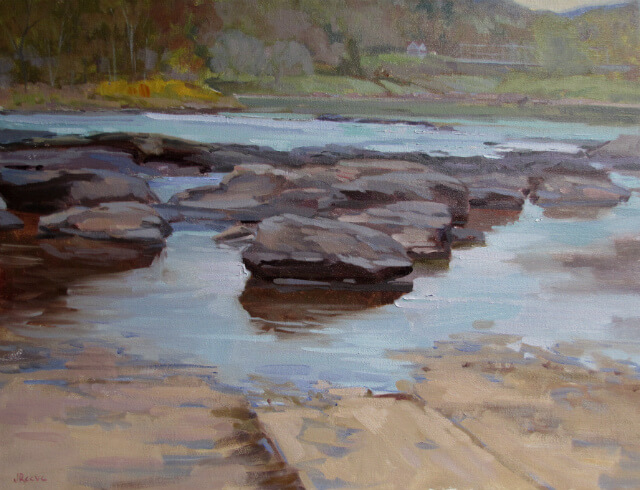 I often find that my second or third take on the scene contains a clearer presence of not just the scene but also the artists’ embodiment in that particular place. This is what one really wants to capture. Not panorama, a tourists view of a place, but the actual presence of the relationship between human consciousness and the world one inhabits. It is this relationship that intrigues us. And it is this relationship that varies between artists. But it is really this new identification with the world, that teaches us something new, real and more powerful than we had suspected. Before this moment we could only Intuit this deep connection between ourselves and this place. The artist, through the image, takes us on a journey from tourist to true participant, engaging our being in a greater whole. I particularly love the images of Rockwell Kent. I feel I am truly present at a certain place as well as understanding my role as a human struggling with my own existence. Those rocks and waves analogously connect me to my own personal as well as universal struggle to live, and to live fully. I feel my own mythic call to engage the world as no other human has engaged. But yet, I also feel my own fragility and need for human contact. This is landscape painting at its greatest. Although my paintings are not epic in scale, I hope they call the viewer to engage in a dynamic participation between place and meaning, between image and human consciousness. That the image itself may call one to invest in a deeply emotive way in the world and allow a new vision to emerge that clarifies one’s relationship to all things.